Are you in a time crunch? Do you feel stressed out or are you in a bind? Breathe. And again. Take a deep breath. Focusing on the breath will take the stress away from thinking about the actual test. Know what you have to do, and concentrate on how you can get it done well in time. Look at your calendar, and the day you will take your test. Count how many days or weeks remain before you take the plunge. Highlight your test day in yellow. Don’t panic! Maybe your nerves are feeling jittery just thinking about that day. Take a breath and put your anxiousness aside. When you confront the test day with confidence, you are forced to know what time you have left before the date. Assess exactly how much time you have prior to your test. Is it days or weeks? This step gives you a sense of what you need to plan for, so you can take more control over your nerves. Feel confident, because even if only two days exist before your upcoming test, you still have the opportunity to prepare. Now that you know the exact time frame of how many days or hours you have prior to taking your TOEFL, create a detailed study plan for reading, writing, listening, speaking, grammar, and vocabulary. Take a pen and journal, or in your notebook or weekly calendar, come up with a plan with study sessions that addresses the priorities you want to get done in the time frame left. How long will you spend on each skill? Whichever skill is your weakest, practice that first to improve upon it. Even practice it longer than you work on other skills. Humans often tend to procrastinate what overwhelms… and the skill that is your weak point is a daunting task. How will you organize your practice sessions to maximize effectiveness? Do not stray from your plan even if you feel overwhelmed. Re-focus your brain to stay on track and get whatever needs to be done completed within the time frame. After you finish every study session, you will feel more confident that you accomplished what you had planned out in advance, which lowers your level of worry. Short on time? If you just have a few days before your test, make a plan to study numerous hours every day or more for each of the days left. If you have a few weeks, create a study plan for minimum an hour and a half per day or several hours at various times every week. What not to do when you fine tune your schedule? When you are setting your study time, avoid a plan to study the night before the exam. The day before the exam should be used as a day of rest so that your mind stays fresh for the test date. You don’t want to be lacking concentration during the listening or speaking sections, do you? You wouldn’t want to run out of steam when you get to the final section, writing, either. So, in your plan, budget the last day before the test as a resting day, with minimal focus on studying. Rather, relaxation will help your mind be at ease and loosen your anxiety. Prioritize what you need to do first by using a study guide. What are you going to tackle during each study session? For how long? Since the exam covers such a wide range of material, you want to make sure you face each skill during your study sessions. If you have test anxiety, maybe it’s because you do not know where to begin. You may feel overwhelmed with too many parts to study at once. This is where prioritizing comes in handy. To reduce your nervousness, attack the study materials by making a checklist of what you must study first as the most important to the least important. Stick to that order. How to know what is the most important? If you use a study guide with practice questions or a sample test, you can pinpoint your weaknesses. Address your weak areas first. In this way, you can use your study time more efficiently. Finally, you need to hit the books. Study! So, if your study plan has a time frame of two hours, then get to work. Sit down and follow your plan. Do not procrastinate, not even 15 minutes. 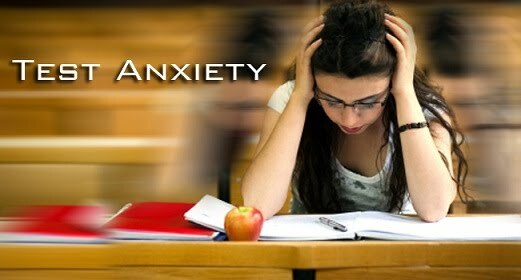 It would increase your anxiety level as the exam day approaches. If you mentally feel like putting it off, just remember your ultimate goal of success. Paint a mental picture of getting to your objective. Know that you will reduce your test anxiety by putting your study plan into effect effectively. If you liked this post, you’ll enjoy Use Technology for Proficiency in English.